Instructions on HOW TO GROW SAFFRON crocus at home from bulbs or seeds or corms are given including tips for getting flowers every year. Commercially saffron is grown in Iran, India Spain, Italy and Greece, Iran being the world’s biggest grower. In Australia the dry summer climate of Victoria, South Australia, WA and some areas of NSW is suitable for growing Saffron Crocus. It is grown commercially in Tasmania. I started growing saffron in my garden in Sydney this year out of my interest in doing experiments. I knew that saffron grows best in temperate areas and dry Mediterranean conditions, but as I live in that part of Sydney where there is no very high humid summer, I decided to give it a try. Saffron is quite easy to grow, even indoors, but requires patience. You simply plant and leave until the plant flowers. Many gardeners trying to grow saffron crocus find that they are not getting flowers on their plants, although the plants are very healthy. Following are the tips and recommendations on how to grow good saffron crocus plants, even in pots that will produce flowers every year. Saffron plant requires full sun. The plant will not grow in shade. Saffron needs rich, well-drained soil with pH 6.5. I made the soil rich by adding compost and rotten cow manure. I added river sand to make it a well draining soil. Read on how to prepare garden soil. Planting time: When to Plant Saffron Crocus? Autumn. The plant prefers Mediterranean conditions, dry summers and rain in winter and spring (SA, VIC, drier areas of NSW). It does not like humid conditions such as north of Sydney and QLD. I plant saffron in a pot that I keep dry. Growing saffron from seeds is difficult, but it grows much quicker and easier from bulbs. Don't buy small fresh corms, they will only flower in 2-3 years. Always buy the mature bulbs, they will produce the very first year, just 8 weeks after planting. Plant the saffron bulbs (corms) at a depth of 10 to 15 cm below the ground and 15 cm apart, keeping the pointed side upwards. Many gardeners suggest to plant the bulb at a depth of 5 cm, but planting them deep will ensure flowering. I have planted 10 bulbs in a very large size pot. You can plant the bulbs in the ground, if you have a sunny spot. The healthy plants will produce plenty of grass-like leaves, don't trim them, even after they die down. This will enhance the potency of the corms below the ground so that they produce more flowers next year. Keep the soil moist when the bulbs are growing and during flowering. Avoid over-watering. prolonged wet soil will rot the saffron bulbs. Allow the soil to dry out when the bulbs are dormant. The saffron plant is disease and insect resistant. The plants will not bloom in the first year. You will only see foliage in the spring, which will die back. The saffron plants will flower the following fall. Harvest the stigmas (saffron threads) in the morning using tweezers as soon as the flower opens. You can throw the yellow stamens, which are of no use. You can also pick the flowers as soon as they open and harvest the saffron. If you leave stigma longer, the potency of saffron will decrease. 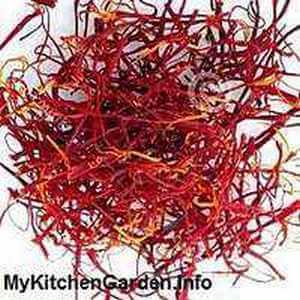 The fresh saffron threads can be used for cooking, or they can be dried and stored. Put the saffron threads in a sheltered dry place on a paper towel for 4-5 days or in a cool oven (50-60 C) for about 15 minutes. You can also dry them in a dehydrator. Why Saffron is so costly? Harvesting the flowers can only be done by hand and it is real back-paining work and time consuming process. The pain does not end there, the real task is the delicate operation to remove the 3 stigmas from each flower and throwing the remaining flower. The whole process cannot be automated. That is why this is the costliest spice in the World. How Much Saffron Will be Produced? Note that each saffron crocus bulb will only produce 1 or 2 flowers, and each flower will only produce 3 stigmas in the first year. About 20 saffron flowers are required to produce about 1 teaspoon of saffron. The number of flowers will increase to 8 or more by the third year. Each bulb will multiply quickly into several bulbs. Separate them every 4-5 years.